To understand the cuts of meat butchers group under the label "round," picture a cow in Bermuda shorts. The waistband would ride somewhere between the short loin and sirloin, while, from the hip pockets down, fabric would cover what butchers call the rump and the round. These cuts are full of flavor, but their muscular leanness requires specific cooking techniques. Of the rounds, bottom round roast or steak requires the most attention. Three cuts of round -- top, eye and bottom -- comprise the muscles at the top of a cow's leg. Top and bottom round pieces wrap around the tubular eye round, with the very top of the whole forming a rump cap. Cleanly separated by membranes, all three cuts can be plump with juice and possess a deep, beefy flavor. Their intense red color and smooth texture make them visually appealing but also signal the absence of marbling fat necessary to make a beef roast or steak tender. A bottom round roast is usually packaged as a half-moon or triangular chunk of meat covered on the top with a thin layer of fat. Bottom round can also be cut into thick steaks, usually called London broil, diced for stew meat or ground. Except for ground round, all cuts need to be cooked with liquid and possibly additional fat to retain juiciness and tenderize tough muscle fibers. Both pieces labelled roast and large London broil cuts can be cooked by braising, or pot-roasting. Some recipes, like those for sauerbraten, require marinating meat before roasting in a vinegar, soy, wine or acidic fruit juice to enhance tenderness. Still others specify dredging meat in seasoned flour, then browning it in fat or oil before roasting. Browning increases the visual appeal of the meat, enhances flavor and creates a surface that holds juices inside meat tissues during cooking. Other liquid or vegetables may be added after browning, after which the roasting pan is covered. Expect a comparatively long roasting time: at least 20 to 25 minutes per pound for well-done and fork-tender. Bottom round is an excellent candidate for slow-cooker braising. One way to shorten the cooking time for meat is to increase its cooking surfaces. 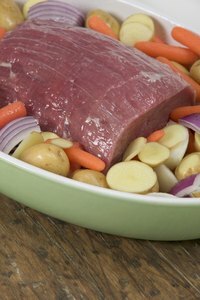 Bottom round roast can be home-butchered down to 1-inch to 2-inch chunks suitable for stews or soups. Long simmering on the stove or in a slow cooker will tenderize meat while retaining the solid beefy taste for which round cuts are valued. Finely dice bottom round at home or ask your butcher to coarse-grind it to cook in chili. The secrets to getting the best out of your piece of beef bottom round are allowing plenty of time and adding liquid when cooking.